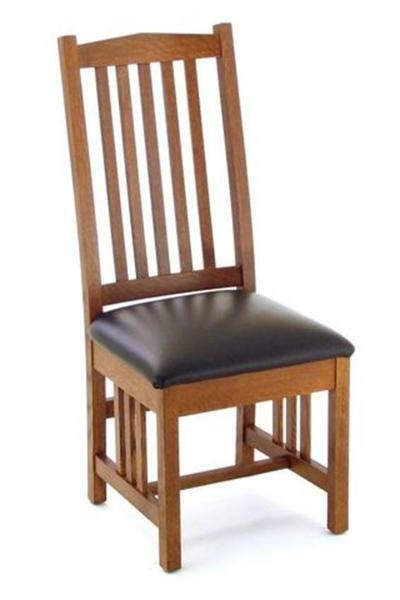 DutchCrafters proudly carries heirloom quality mission style furniture including our California Mission Dining Chair. This handsome California Mission Dining Chair is handcrafted by skilled hands. 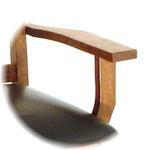 This is a straightforward, well-designed authentic mission chair that will complement most business and home decors. All the pieces in the Prairie Collection are constructed from solid hardwood using old craftsman joinery techniques. Every structural joint on the frame chairs in our Prairie Collection are mortise and tenon construction. This mission chair is extremely comfortable and strong. Added strength and stability in the construction can be added if the chairs will be used for contract furniture, hospitality furniture or a commercial location. Visit our Contract Sales Page for more information on this mission chair for business. The Amish woodworker that builds the dining room chairs for our Prairie Collection even harvests his own wood, promoting long-term sustainability and ecological furniture benefits. Call with questions on our solid wood furniture and this quality crafted mission dining chair. We offer a wide variety of Mission Dining Tables to complete the look for your dining room furniture or kitchen collection. Shop online or let us help you find the perfect choice. We are happy to send out stain or paint samples to help you match these chairs to existing furniture. Just call one of our Amish furniture specialists today at 866-272-6773. Custom stain matching is also available upon request. You can see our chairs and samples in person at our Amish furniture store in Florida. Seat Height: 17 ½" - 18"
Seat Height with Upholstery: 19" - 21"